People can go on and on about how much they love their mattress (I know I do! ), but how often do you hear someone talk about how much they love their mattress pad? The mattress pad is the unsung hero of the bedding world. The main job of a mattress pad is to protect the mattress you love, and it’s an important job! It keeps the mattress clean, guards it from excess moisture, and helps protect the mattress from normal wear and tear. A good mattress pad is almost unnoticeable and lets the comfort of the mattress come through. I sleep on a Bella Sera organic latex mattress which has an organic cotton knit casing with a lot of flexibility. 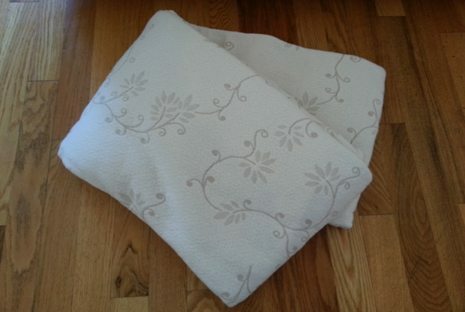 To protect my mattress that I love, I was using a quilted, organic cotton percale mattress pad that felt a little stiff. After doing some research, I started thinking that a mattress pad with a little bit of stretch might be a better fit for me and my mattress. I recently switched to the Suite Sleep Organic Cotton Mattress Pad. The Suite Sleep mattress pad is made with a 100% organic cotton stretchable knit fabric. I immediately noticed that, compared to the quilted percale that has less give, the knit of the Suite Sleep mattress pad complimented the knit of the Bella Sera casing, making for a more comfortable feel. It’s not bulky or obtrusive. It’s just there doing its job. When it needs to be cleaned, I can easily throw it in the washing machine and the dryer, which is something I can’t do with my mattress. The Suite Sleep Organic Cotton Mattress Pad has 15” pockets with elastic all around the bottom edge which makes it a good fit on both thicker and thinner mattresses. I really like knowing that I’m protecting my organic mattress with a healthy, chemical-free, organic mattress pad. With the stretchable knit fabric, the Suite Sleep Organic Cotton Mattress Pad is ideal for protection and comfort on natural and organic latex mattresses, but is a great choice for other mattress types as well. It might be difficult to get excited about a mattress pad but when you invest in a mattress, a mattress pad plays the most important role in protecting that investment. The Natural Sleep Store is excited to offer the Suite Sleep Organic Cotton Knit Mattress Pad (choose your size, up to a $249 value) as our current giveaway! No purchase necessary. Contest ends July 31st, 2014. Congrats to Kristin S., of Wilmington, MA, the winner of this giveaway!